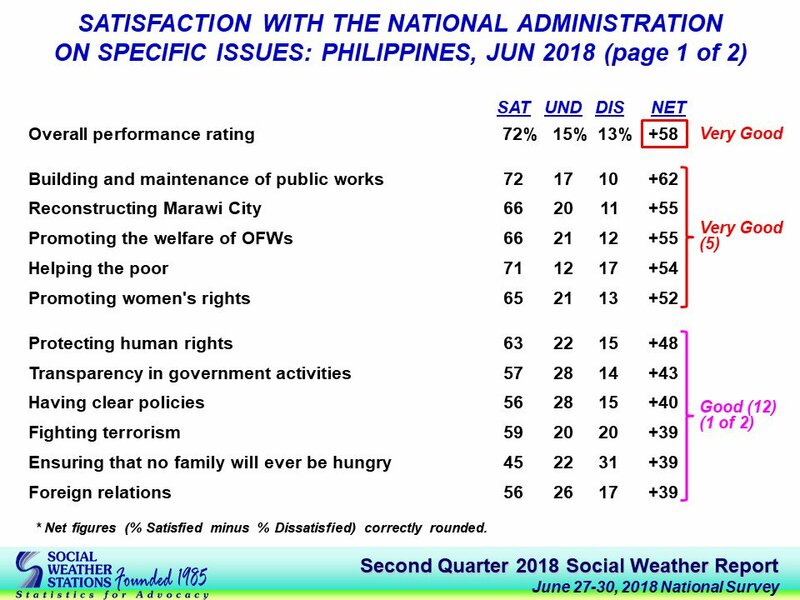 MANILA -- President Rodrigo Duterte's administration maintained its "very good" net satisfaction rating for the second quarter of 2018, according to a survey conducted in June by the Social Weather Stations (SWS) Sunday. The current administration maintained its +58 net satisfaction rating from the first quarter of the year. That survey was conducted in late March. The second-quarter survey found that 72 percent of adult Filipinos are "satisfied" with the general performance of the government, 15 percent are "undecided," while 13 percent are "dissatisfied." The Duterte administration maintained its net satisfaction rating from March to June 2018 due to increases in net satisfaction in Mindanao and Balance Luzon, combined with decreases in Metro Manila and Visayas. The administration's net satisfaction rating stayed "excellent" in Mindanao, up by 4 points from +72 in March to +76 in June 2018. The net satisfaction rating in Balance Luzon also stayed "very good," from +50 in March to +54 in June 2018. In Metro Manila, the net satisfaction rating dropped from "very good" to "good," decreasing 11 points from +58 in March to +47 in June 2018. It also stayed "very good" in Visayas despite dropping from +57 in March to +56 in June 2018. In classes A, B and C, the government's net satisfaction rating rose from "very good" to "excellent," up by 25 points from +56 in March to +81 in June 2018. It stayed "very good" in class E, up by 8 points from +54 in March to +62 in June 2018. The administration's rating also stayed at "very good" in class D despite a two-point drop from +58 in March to +56 in June 2018. The 1,200 respondents interviewed for the survey were also asked to rate the government's performance on several subjects. The Duterte administration's net rating rose from "moderate" to "very good" on promoting women's rights, while it rose from "moderate" to "good" on deciding quickly and ensuring that no family will ever be hungry. However, the administration's ratings fell from "very good" to "good" on the subjects of fighting terrorism and protecting human rights. It also fell from "good" to "moderate" on the subjects of reconciling with communist rebels and defending Philippine sovereignty in the West Philippine Sea. The administration maintained its "very good" rating on the subjects of building and maintenance of public works, reconstructing Marawi City, promoting the welfare of OFWs and helping the poor. It also maintained its "good" rating on the subjects of having clear policies, foreign relations, fighting crimes, ensuring an efficient public transportation system, fulfilling commitments in international treaties, reconciling with Muslim rebels and eradicating graft and corruption. The administration, likewise, retained its "neutral" rating on the subject of fighting inflation despite a seven-point drop from +6 in March to -1 in June 2018. The survey was conducted by the SWS from June 27 to 30 using face-to-face interviews of 1,200 adults ages 18 and older nationwide. The SWS surveyed 300 adults each in Metro Manila, Balance Luzon, Visayas and Mindanao. It had sampling error margins of ±3% for national percentages, and ±6% each for Metro Manila, Balance Luzon, Visayas, and Mindanao.